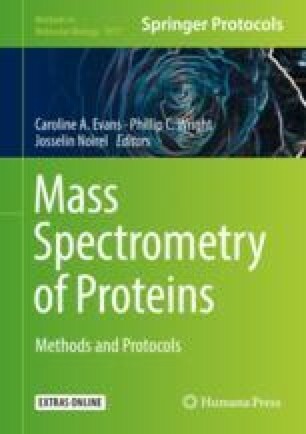 Affinity proteomics (AP-MS) is growing in importance for characterizing protein-protein interactions (PPIs) in the form of protein complexes and signaling networks. The AP-MS approach necessitates several different software tools, integrated into reproducible and accessible workflows. However, if the scientist (e.g., a bench biologist) lacks a computational background, then managing large AP-MS datasets can be challenging, manually formatting AP-MS data for input into analysis software can be error-prone, and data visualization involving dozens of variables can be laborious. One solution to address these issues is Galaxy, an open source and web-based platform for developing and deploying user-friendly computational pipelines or workflows. Here, we describe a Galaxy-based platform enabling AP-MS analysis. This platform enables researchers with no prior computational experience to begin with data from a mass spectrometer (e.g., peaklists in mzML format) and perform peak processing, database searching, assignment of interaction confidence scores, and data visualization with a few clicks of a mouse. We provide sample data and a sample workflow with step-by-step instructions to quickly acquaint users with the process. The authors acknowledge support from NIH grant U24CA199347 and NSF grant 1458524 to the Galaxy-P team members (P.K., S.M., J.J., P.J., T.G. ), the Moffitt Lung Cancer Center of Excellence (P.S. ), and the NIH/NCI F99/K00 Predoctoral to Postdoctoral Transition Award F99 CA212456 (B.K.). This work has been supported in part by the Biostatistics and Bioinformatics Shared Resource at the H. Lee Moffitt Cancer Center & Research Institute, an NCI designated Comprehensive Cancer Center (P30-CA076292).